We're all familiar with the term 'red-faced' but one girl's given the idiom a literal meaning after an unfortunate experience with body glitter. The Twitter user took to the social-networking site to reveal the disastrous result after having applied the supposed 'washable' glitter to her face and we're mortified for her. With face-paint season fast approaching, i.e. Halloween, one Twitter user has issued a warning to people everywhere to air on the side of caution. 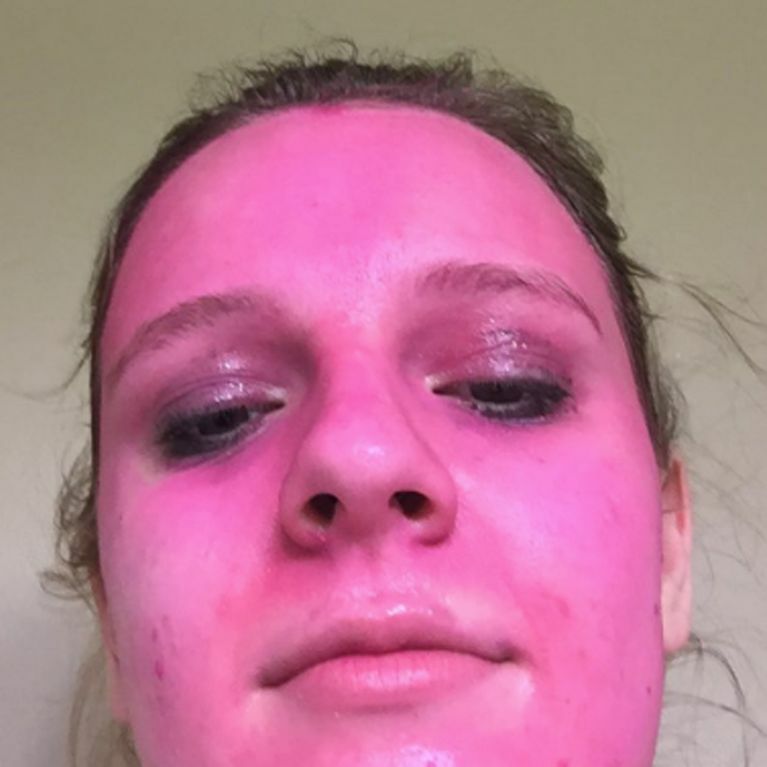 Leah was left red-faced, literally, after applying supposed 'washable' pink glitter to her skin. The product in question is Palmer Paint Product's Washable Glitter Poster Paint Pink Glitter - the operative words being poster paint - i.e. not intended for skin application. She took to Twitter to share photos of her glitter-painted face, the bottle's label which read, 'washes easily off skin' and her still-heavily pigmented face after presumably having tried to wash it off. She captioned the images: "See you in court Palmer Paint Products." Twitter users were left equally horrified and amused by the unfortunate incident with many questioning Leah's decision to paint her face in the first place which is not an uncommon practice at this time of year. However, many took it as an opporuntity to showcase their comedic wit with one writing: "The pink panther is shaking!" Another commented: "She was going for that Pepto Bismol™ lewk [sic]." However, some sensible Twitter users were quick to point out that the paint probably isn't suitable for application to the skin, especially when you consider it's sold in stationary and not beauty shops, and pointed the finger at Leah for ignoring this vital detail before going ahead with her experimental beauty routine. One wrote: "@BenfleetButcher the glitter has washed off. Don't think they mentioned the paint being washable." Another added: "Nowhere did it say it was face paint it's probably means it'll eventually wash off your hands." Palmer Paint Products are yet to comment on the issue but the product description for the paint responsible for this epic mishap states: "It's a truly washable school paint. This glitter poster paint is child-safe, non-toxic, and easily washes from skin and from most fabrics with mild soap and water." It's not yet known whether Leah has been able to wash the paint off properly. soFeminine has reached out to Leah and Palmer Paint Products for comment.